Bill Malone has hosted a program on WORT for over 15 years called 'Back To The Country', wednesday mornings on WORT 89.9fm. He kindly asked me to come on his show and play a couple songs and talk about my new CD 'Wiegel Room'. 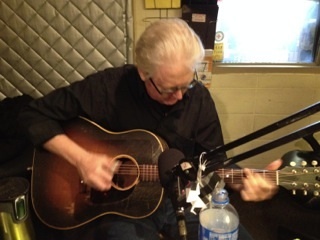 I played Wiegel Room, Descending, and Wednesday Blues live in the studio, and Bill played Candi, Pat's Blues and Continental Blues from the CD. (Bill and his wife Bobbie, myself, and the Kristy Larson Honky Tonk Trio also perform as the "Back To The Country Revue".) We covered a lot of ground including my 50 years as a performing musician, growing up in a musical family, and future plans. Thanks Bill and Bobbie and WORT for supporting live, local music. Click on BUY ALL button to the right, it will take you to checkout where the price is FREE!